Prime Time VII is a Pacific Northwest Ed Monk design built by Nordlund Boat Company of Tacoma, WA. Nordlund, a 60 year old builder of high quality yachts, is highly regarded as a premier builder of Pacific Northwest style yachts and Prime Time VII is representative of Nordlund’s high quality construction. Prime Time VII has a documented tonnage of 160 Gross Tons, indicating the volume and spaciousness of her interior, and 7’ headroom throughout. 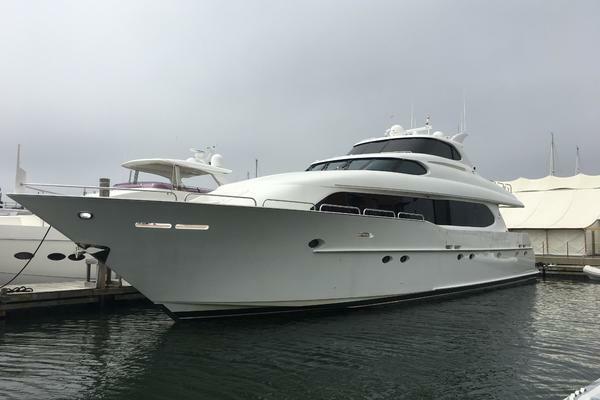 Her present owner (second owner) purchased her in October 2015 and completed an extensive refit from October 2015 – May 2016 at an approximate cost of $500,000. Refit items included major engine service with new coolers, major generator service, new Aqua 3 phase air conditioning chillers with 10 HP inverter and new duct work, very extensive new electronics, stabilizer overhaul with new components including fins, hydraulic davit overhaul, new Walker Bay Model 450 14’ 9” tender with stainless steel arch, electronics, and 70 HP Yamaha, new Switlik 6 person SAR military grade liferaft and safety equipment, new vinyl bridge enclosure, new flybridge seating. Extensive new electronics include on flybridge - 4 Garmin multifunction displays, Garmin GPS radar function, Garmin auto pilot, Garmin display for engines, 4 adjustable Lorex 360º cameras for engine room, stern, and side views, 3 Garmin multi-function instruments including wind. The electronics are duplicated in the pilothouse. New KVH model 6 HD Sat TV, new KVH model 7 Wi-Fi/Sat Phone, and new antenna domes. New AV equipment including 6 Samsung flat screens television sets, Panasonic 3D Blue Ray DVD player, Fusion Stereo Controller, speakers on bridge and aft deck, Onkyo AV receiver, and Garmin display in engine room. The Pilothouse is accessed through a Freeman Offshore sliding door on the port side. The helm is located off-center to starboard. Newly upholstered Tracy electric helm chair and wrap around mini couch, and a small dinette. Aft of the pilothouse down two steps is the Main Salon and dining area. The Main Salon is full beam and spacious. On the port side is a large C-shaped couch approximately 15' seating eight guests. 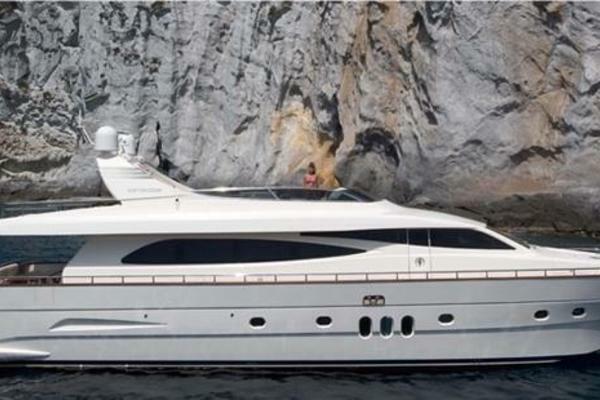 To starboard opposite is a long granite counter with wet bar, liquor storage, built in new Samsung flat screen TV, and entertainment center. The dining area has a glass top table and upholstered chairs. A custom granite counter top with storage underneath is located at the forward end of the dining area. Opposite to port is a small office desk and a day head. The teak aft deck measures 10' x 18' and is accessed through an electric push button controlled sliding Freeman door. An overhang covers the deck and the aft end and sides are open. To port is a curved spiral staircase leading down to the swim platform area and a watertight door leading to the engine room. Forward from the salon/dining area, down a few steps, is the galley. It is an open area with six large windows, a center island and built-in TV with combination radio, DVD, and CD player. There are full size Kitchen Aid appliances including side by side refrigerator and freezer with water and ice dispensers, GE convection microwave oven, Gaggenau oven and cooktop, Kitchen Aid dishwasher and trash compactor, and sink. The counters are off white Corian with matching black accents. From the port side, just aft of the pilothouse, a spiral staircase leads down to a foyer on the lower deck. Accessed from here are the Master Stateroom, VIP Stateroom, and a second Guest Stateroom. The crew quarters are forward of the galley. The forepeak cabin has a double berth to port, single berth to starboard, and head with stall shower. There is a Pullman berth in the passageway for additional crew. Hull and Superstructure designed by Edwin Monk, N.A. The engine room and tool room are located at the aft end of the vessel, and are accessed from the swim platform through a water tight door or from the aft deck by a deck hatch and ladder. Below is a workshop, storage, steering gear access, and lazarette. Farther forward is the air conditioned engine room with 7’ headroom and very good space for ease of servicing the engines, generators, and other equipment. The engine room can be monitored by a 360º Lorex camera. Mathers single lever engine controls. New ACR Globalfix Pro 406 MHz GPS EPIRB mounted on bridge. Life jackets stored in 2 new Yeti chests (aft cockpit deck and aft bridge deck). New 12 fire extinguishers located throughout vessel.